Last week when I was in Seattle I had the opportunity to talk with Rick Mulready for his Inside Social Media podcast series. We had a good conversation, and I think you might find it helpful. You can listen here, or download directly as mp3. You’ll also want to check out some of the segments in the archives, including the inaugural edition featuring Scott Monty. Tomorrow I’m honored to get the chance to be a guest co-host on For Immediate Release: The Hobson & Holtz Report. Neville, the first half of the duo, has some conflicts and needed the week off, so Shel asked me to join him on the Thursday program. Steve Crescenzo filled in ably on Monday. I’m looking forward to the experience; we’re recording at 11 a.m. CDT. Shel and I have exchanged topics for the discussion and I think it will be a good program. We’ll be talking some about social media in health care, but also some more general topics. Since it’s a podcast, you can’t listen live…but if you want to tweet questions or comments, use the #FIR tag. I will post the program when it’s done. Update: Here’s the link to the FIR podcast post. Let me know what you think! Earlier this week I had the opportunity to do an interview with Shel Holtz for the For Immediate Release Interviews series. 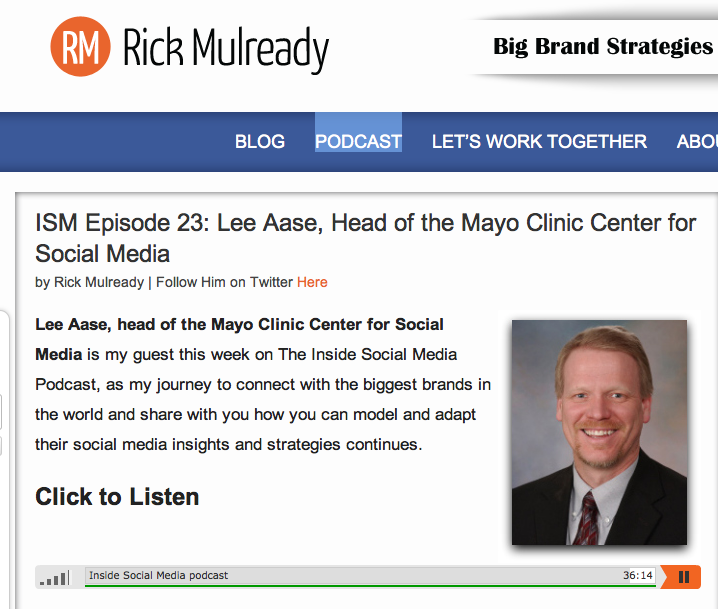 I hope you’ll check out the Sharing Mayo Clinic blog, which we discussed in the interview. This earlier SMUG post has more background on all of our Mayo Clinic social media efforts, including Sharing Mayo Clinic. If you are interested in becoming a SMUGgle, see the Enroll Now page. Author Lee AasePosted on February 6, 2009 Categories Health Care, Podcasting, Social MediaTags FIR, For Immediate Release, podcast, Shel HoltzLeave a comment on Welcome FIR Listeners! It was a week ago today that we launched our new Mayo Clinic blog, called Sharing Mayo Clinic. You can see some of the related news stories here, but I also wanted to post a link to the segment Shel Holtz and Neville Hobson included on their For Immediate Release podcast (Episode 416) last Thursday. You can hear the portion specifically about Sharing Mayo Clinic below, but of course I recommend that you subscribe so you can get their “hefty and good” podcast delivered automatically to you twice a week. I’m scheduled to have a recorded conversation with Shel and Neville next week (not sure whether it will be an Interview or a Cut), so if you subscribe you’ll get that delivered as well. I’ve known Shel for several years, and he has consulted with us a couple of times, providing an outside perspective on and validation of our plans. He and Andy Sernovitz have been really helpful to us in getting social media programs going at Mayo, so I’m looking forward to sharing our progress with the FIR community.